Do you ever feel like your lead generation offer is just a needle in a haystack? How can you stand out in a crowd when everyone is yelling the exact same thing? With so much noise it’s hard to be heard. What if you could grab the attention of your target audience and give them an offer they can’t refuse? You totally can and this article will show you how. 50% of marketers state lead generation as one of their biggest challenges. That’s because telling someone you’re giving them something for “free” doesn’t hold as much weight as it used to. Over the past two-years our marketing team has developed a solid game plan for generating leads. We’ve learned from our mistakes and have determined the highest converting offers and how to target them. I’m going to share our 4-step strategy with you to get visitors clicking almost every time. Knowing your buyer is the key to increasing conversion. The more you know about someone the more you can personalize your offer. Not knowing your customer is like buying a gift for someone you don’t know. You buy a gift based on limited information.They open it and you see a “why did they get me this,” look on their face. Asking a few questions first will help you get the right present in the box. You can obtain this information by evaluating your current customers or conducting surveys on your site. The key is to create one ideal customer that fits into a larger segment. Generally this segment will respond to a message in a similar fashion. Lululemon’s buyer persona is named Ocean. Ocean is a 32-year-old graphic designer who is physically fit, well educated and affluent. She’s married to Duke, a 34-year-old architect who’s also interested in staying fit. Ocean has helped turned faceless buyers into real people. This gives both designers and the marketing team the ability to devise concepts and garments that people love. You need to blend your content with their lifestyle. This is easier to do once you know who is buying your product. You’re not just solving a problem you’re creating a solution that resonates with their lifestyle. Wishpond’s buyer persona is a marketing professional who is looking for new ways to easily generate and nurture leads online. This person is a marketing professional who is looking to make their job more efficient and their marketing more optimized. What are their marketing goals? Which marketing channels are most important to them? How much influence do they have in purchasing decisions? If they don’t have a final say on if they’re purchasing a product you need to have offers that they can take to their boss. When you know who they are and what their business goals you can tailor your content to suit their needs. Encourage people to download your lead gen offer by giving them a way to take action. Instead of simply giving them a generic rundown of best practices give them a way to apply them. For example, which one would you rather download? You’d go with the second option which provides you with a way to easily implement the strategy. Offer: Provide a mortgage checklist for prospective home-buyers. Why it works: This lets people know that it’s not as simple as applying for a loan and getting it. They need to follow a step-by-step way to be approved. You’re giving them the way to do this. Offer: Provide a step-by-step guide on how to generate leads from blog readers. Why it works: Inside this guide you would provide them with a detailed step-by-step process of how to obtain and nurture this blog reader until they’re a customer. Offer: A survival guide that features different outerwear for sports around the world. Offer Title: “Ultimate Survival Guide for Different Regions around the World"
Why it Works: It gets people excited about their next outdoor adventure. They’ll be excited about their next adventure and ready to buy their gear. Offer: Offer people a way to decide on their travel destination. It could be a “choose your own adventure” type of guide. Hot or cold? Beaches or mountains? Adventure or relaxation? After they’ve made all of their choices you could give them a suggestion of where they should go. Why it works: Sometimes the biggest challenge with traveling is deciding where to go. Make it easy by asking the types of questions a travel agent normally would and giving them suggestions. At any given time during the year there’s a holiday you can use to put a festive twist on your offers. Instead of just offering your customers “Six CTA formulas” you can offer them “Six CTA formulas for Valentine’s Day.” This will increase the power of your offer at the beginning of February because your leads will be thinking about how they can leverage Valentine’s Day. There’s the big ones - Black Friday, Christmas and New Years…the mid-sized ones - Valentine’s Day, Halloween, St. Patricks Day…and the little ones - Balloon Ascension Day, Best Friend’s Day, Magic Day. Let’s say that you wanted to market your ice cream shop. Best Friends Day is an excellent day to do this. 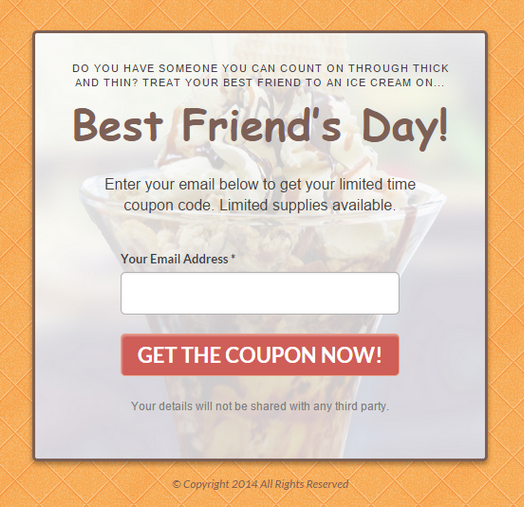 You can offer a 50% discount on ice cream that day only if you’re buying one for your best friend. Buyer: Person looking to buy their significant other the perfect Valentine’s Day present. Lead Gen Offer: Lookbook - What to buy your significant other for Valentine’s Day. Give them different ideas for what they can buy. Lead Gen Offer: Countdown Calendar to Black Friday/Cyber Monday. You could provide the marketing strategy to help B2C businesses increase sales. Pro Tip: Show prospective leads how much your free content is worth. Show this by attaching a specific dollar amount to your offer. Neil Patel uses this concept on his blog’s lead gen form above. Under the title he provides an exact value for his free course - 300 dollars. 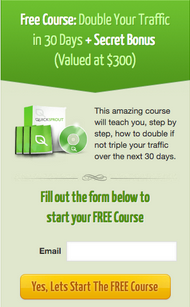 This way people will feel more intrigued to convert on this offer because they’re not just signing up for another free course. Rather, they’re signing up for a course where they’re actually saving $300 by not having to spend it somewhere else to get that same educational information. You want to personalize your offers based on your lead’s position in the buying cycle. People will be interested in different types of content based on how close they are to buying. It’s like when you’re in a relationship with someone and you’re asking them to marry you. If you ask them to marry you on your third date the answer will probably be no. But, if you’ve been dating for a while and really love each other then it’ll most likely be a resounding yes. You can get leads moving forward by targeting them with lead-nurturing offers for their placement in the buying cycle. Send out a highly personalized email that contains an additional lead gen offer. This is kind of like a “thank-you” page in email form. This is your chance to show them another valuable offer. Leads aren’t all created equal. Some enter at the top of your sales funnel, some from the side. Some are qualified, warm and ready to buy; others will move slowly, requiring weeks of careful nurturing before they convert. Tracking your leads based on action and source and then hitting them with a relevant offer at the right moment will result in more initial conversions and more loyal customers down the line. This person is someone who has shown interested in your content but not yet in the products. They’ve been to your website, know who you are and have signed up for at least one of your offers. Keep them engaged by offering them a super-relevant offer linked to what they’ve already gotten from you. If they attended a webinar on lead generation invite them to sign up for a video mini-course on a more specific topic. You know they already enjoy learning through video - they registered for your webinar. A video course will further their understanding on the specific topic. If they downloaded a travel guide for a particular city send them a podcast that provides additional information of the destination. For example, if the travel guide was for Vancouver the podcast could take them on a walking tour through Gastown - an historic area of the city. This gets them excited about going because they’ll already have something fun to do when they arrive. With MQLs, you must avoid sending them sales-focused content. This will push them away from your product. Wait until they’ve given you a signal. This person has shown interest in your products by checking out your product or pricing pages. This person is thinking about purchasing your product but hasn’t taken the final step. They might be looking for a better deal or maybe they aren’t sure if your product is right for them. These people are primed to be pushed from an SQL into a sale! Offer them a coupon or free shipping that will expire within 24 hours. This will encourage them to go back to your website and complete their purchase. Offer a buyer’s guide that contains product specifications, comparisons and customer testimonials. If someone looked at your product but didn’t buy it there’s a good chance your site didn’t answer all of their objections. Giving them a detailed account of the product will help nurture their purchase. Offer them a buyer’s guide so they can decide which solution is right for their business. This will give them the pro’s and con’s for each solution provider and how it will look in action. Case Studies: They’ll be able to see how you’ve helped other companies reach their goals and they will infer you can help them do the same. Offer a product demo with a specialist so they’re able to see how your products work and how they’ll fit into their business. Follow this 4-step blueprint and no one will be able to turn down your offer. Get started today and grab the attention of your target audience.